Tuesday we went to see Trier. It is one of the oldest cities in Germany (some claim the oldest), and at one point was one of the capitals of the Roman Empire. There was a lot to see. I took over 200 pictures. LOL Let’s just say with Rick, Rebecca and me having cameras, we looked very much like tourists. I have 60 pictures uploaded on facebook for those of you interested to see more. And notice the blue sky? We had wonderful weather there! Yesterday we went to see to the Sea of Rock. I will show you some pictures on Saturday. Today we are heading out to either Oppenheim (ferry ride over the Rhine, old church with basement full of skulls!) or to Mainz (another Dome and old Roman town). In The Netherlands we are having the same weather. I’m glad you’re having a good time in Germany. Wonderful scrapbooking material right there… Will that inspire you to scrap a little when you come back home? Gorgeous photo.. hope your having a blast! I LOVE Trier! 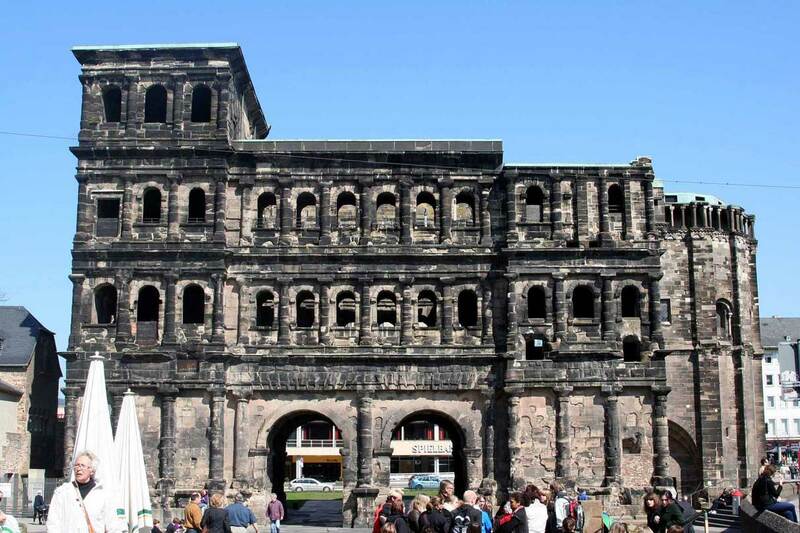 My family is from Germany and Trier and Aachen were two of my favorite places to visit growing up…. You just don’t have those kinds of sites in America. Just breathtaking! Isn’t Trier lovely..I am sure you loved this little village. We luck enough to visit while my sil and husband were stationed in Germany. Keep enjoying the Wonderful Beauty of Germany. Oh Wow, sounds like you are having a fantastic trip!! I have been there we are making plans on going to Germany in Oct.